As someone with Celiac disease, going out to eat has always been challenging. Not only do you have to do research beforehand to find out if there are gluten-free offerings, but you have to clearly communicate your allergies to the server, cross your fingers and hope they understand what you’re talking about. However, I recently discovered a restaurant (within walking distance of my apartment; bonus!) that alleviates all of those concerns. 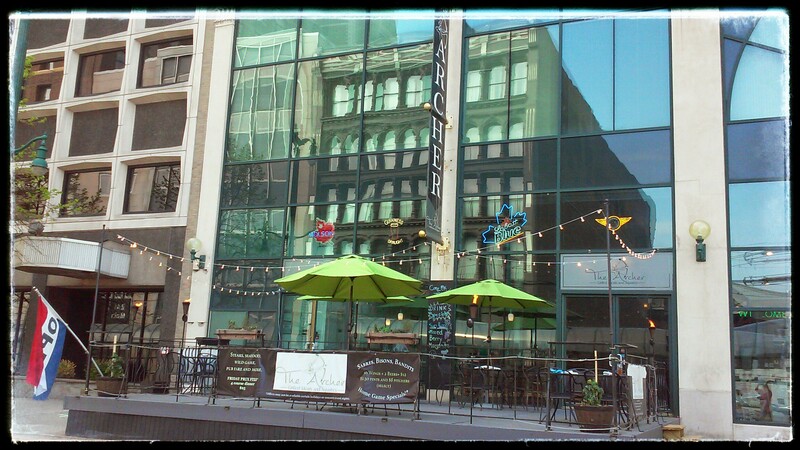 Meet The Archer, one of the most gluten-free and allergy-friendly eateries in Buffalo. 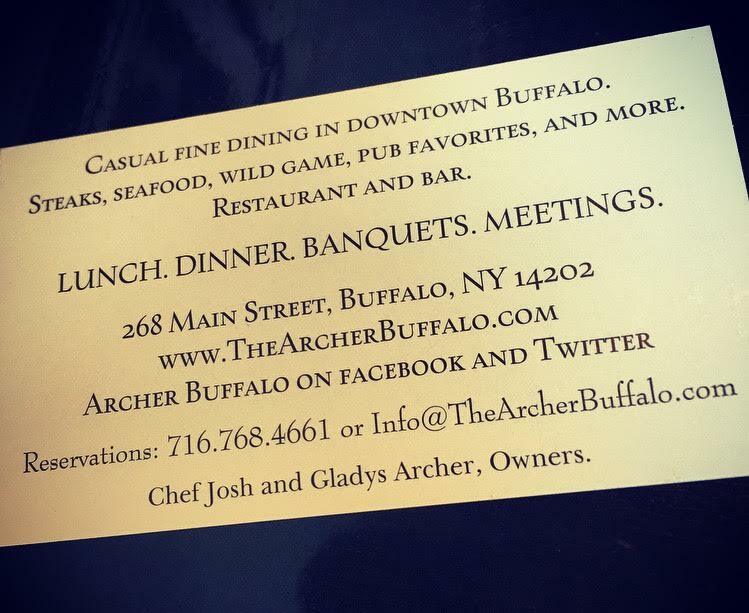 Established in 2013, and located right in between Buffalo’s Theater District and HarborCenter, The Archer is a place for people to come to enjoy downtown and grab a bite to eat. I had the pleasure of meeting the owners, Gladys and Josh Archer, during my first trip to the restaurant on Friday, July 31. I walked in and was surprised by the decor and ambiance; soft music filled the room and the hostess was extremely friendly. Gladys came over to welcome us and immediately made me feel at home, as she detailed the restaurant’s passion and dedication to providing an incredible dining experience for eaters with severe allergies. About 90 percent of the menu was naturally gluten-free. 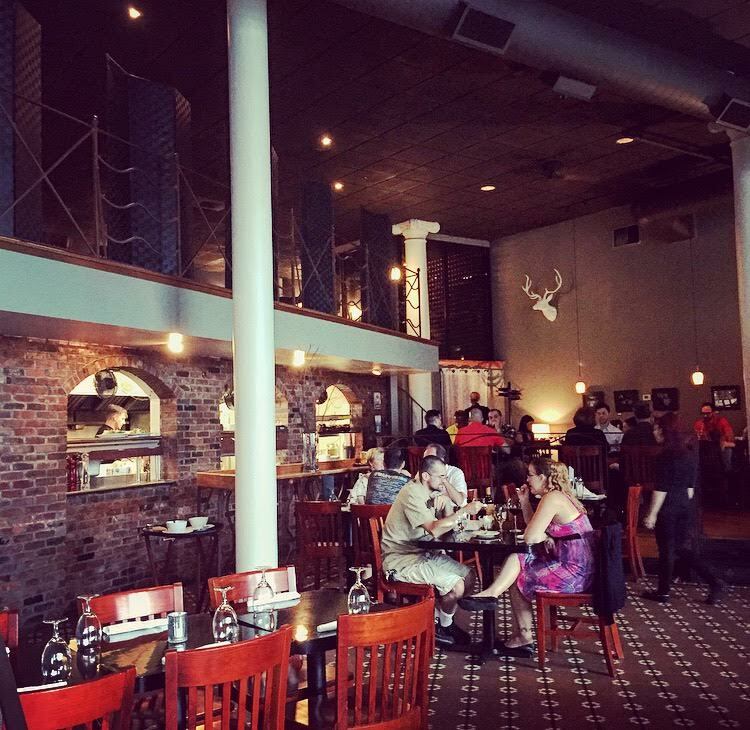 The menu was extremely eclectic; you can order seafood, wild game, pasta, wings or pizza. Both gluten-free buns and pasta are available. 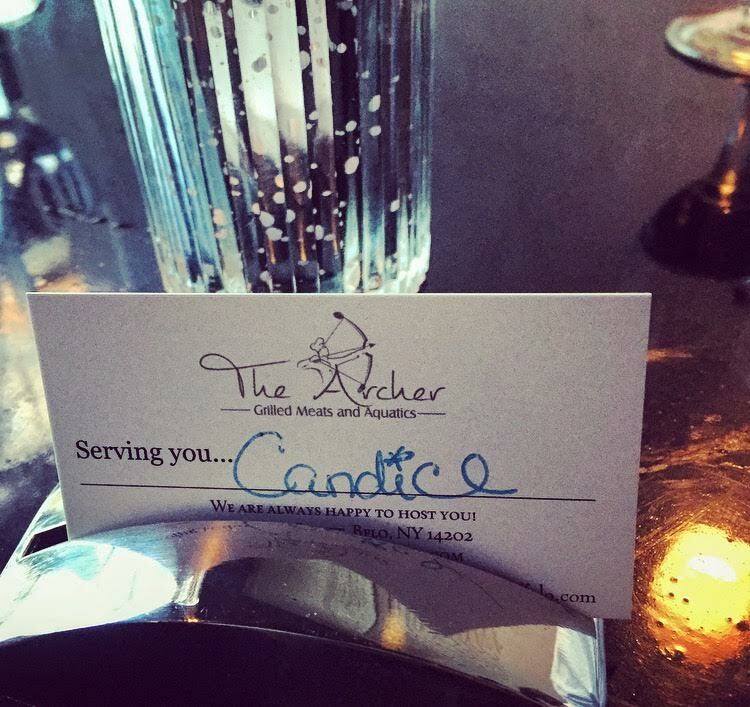 The Archer’s ability to cater to the classy and the casual is just one of the things that sets it apart from other eateries in downtown Buffalo. Come dressed in jeans and grab some wings and a beer before the game. Or feel just as comfortable in a dress, demanding a filet. It is clear to see that both the menu and ambiance at The Archer were crafted with care. With 90 percent of the menu being naturally gluten-free, The Archer is known as an eatery where even those with a laundry list of allergies can go and have a normal dining experience. “We wanted to create a place for friends and families to come together to enjoy a hearty and healthy meal. We wanted people with allergies to feel comfortable and cared for when dining out,” said Gladys Archer. The Chef, Josh Archer, got his Gluten Free Certification at a program sponsored by a national food distributor at the Chautauqua Institution. He takes great care in catering to a variety of allergies by preparing all meals separately. If you think that’s dedication, you won’t believe this: The Archer has a designated gluten-free frier. I repeat: The Archer has a frier solely dedicated to gluten-free food! Why make an investment like that? 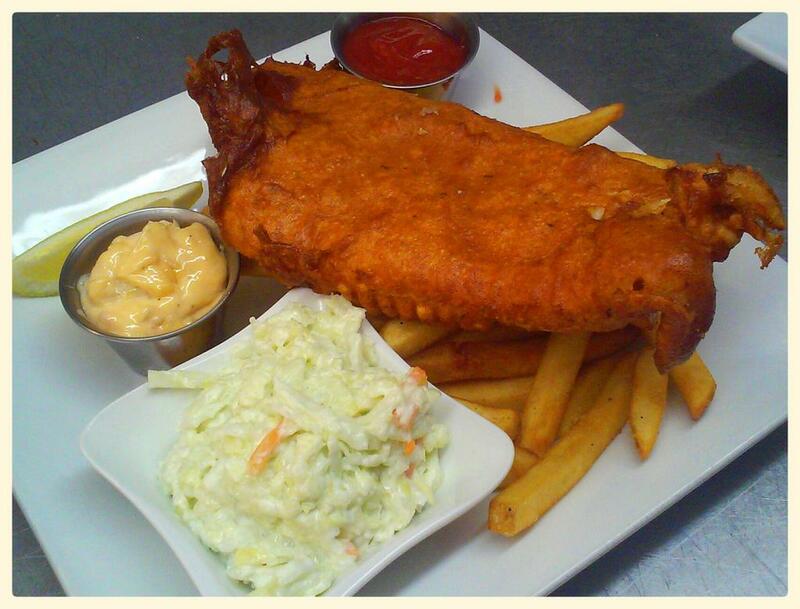 Because the Archers wanted their friends and family to be able to enjoy some deep-fried options – including a fish fry during Lent! After getting a number of canker sores in recent months (my typical reaction when I ingest gluten,) I have been hesitant to go out to eat recently out of fear of getting immediately sick, or developing a painful sore a few days later. A delicious meal and advice on how to shorten the lifespan of my killer canker sores? I felt like I had died and gone to heaven. …Then the food came out. We started with the Venison Sausage (which was featured in Step Out Buffalo’s 21 Favorite Dishes in 2014) and the Black and Bleu Clams Casino. As someone who prefers fish and vegetables to meat any day, I was nervous to try the venison. Wild game, a huge point of differentiation for The Archer, has incredible health benefits; it is generally lower in fat and cholesterol and, depending on the meat, typically has a greater percentage more protein when compared to beef. 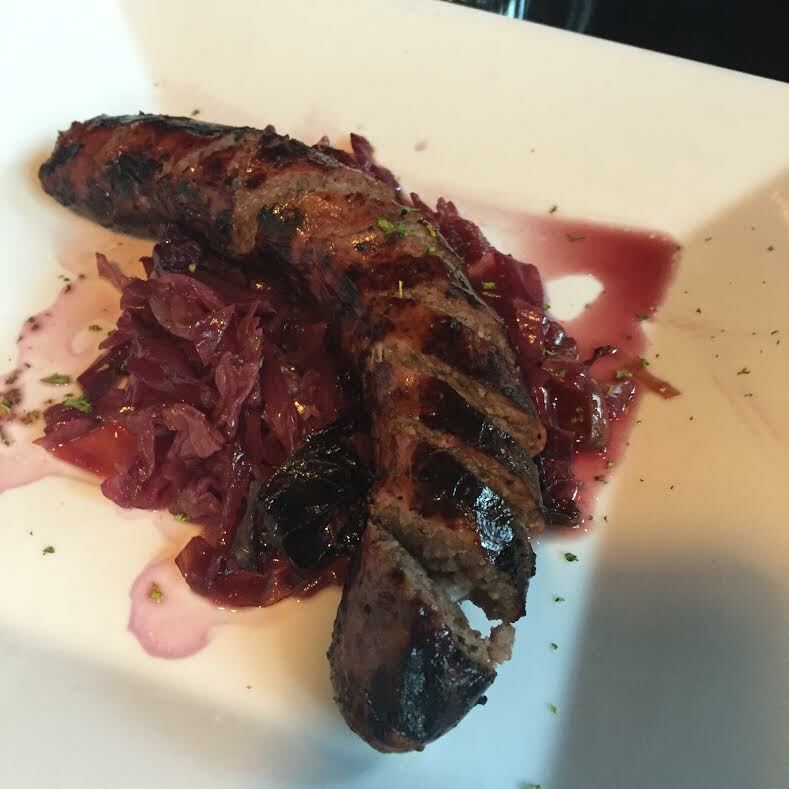 The Venison Sausage (made with free range Axis Venison) was served over a flavorful bed of braised, sweet, red cabbage. It was cooked to perfection and tasted lean and clean. 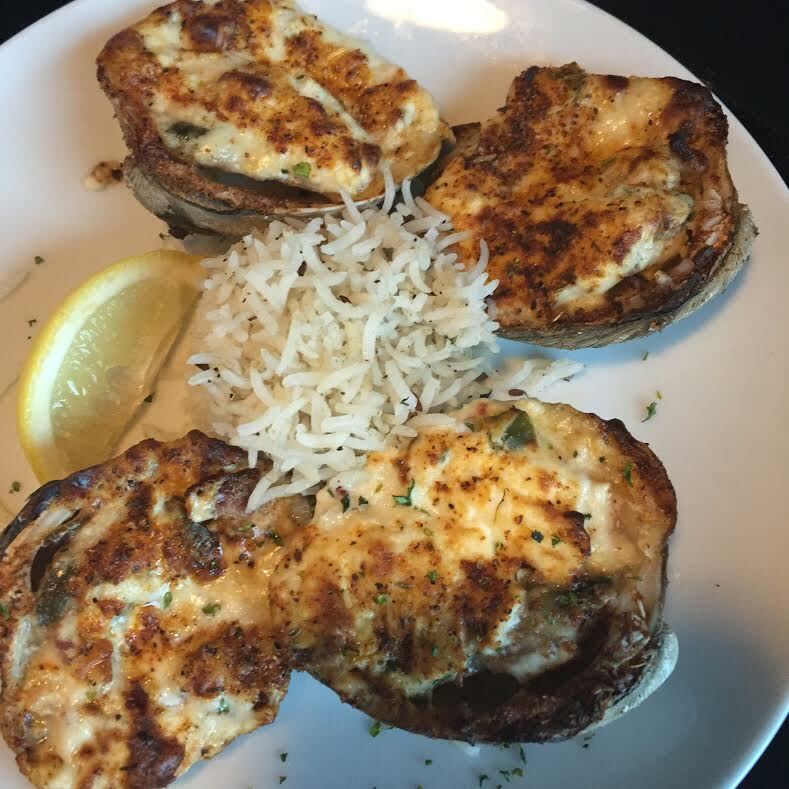 The Black and Bleu Clams Casino is described on the menu as a “bleu cheese twist on Cajun dusted classic clams.” It was served with a slice of lemon and scoop of basmati rice, and was rich, creamy and flavorful. I considered licking the plate, but didn’t want to offend Gladys. We finished with the Scarlett Cupcake which is free of gluten, egg, dairy and nuts, and was created with Josh and Gladys’s daughter in mind. When you remove all of those ingredients, you’re not usually left with something as flavorful and fluffy as this cupcake; I was pleasantly surprised. Throughout our meal, I found myself taken aback by Gladys and Josh’s passion and knowledge of food allergies, wild game and the restaurant industry. The Archers are a couple who have committed their life to creating a safe space for families and friends to eat and enjoy. The Archers are also a couple that feels strongly about showing the Buffalo community that wild game isn’t something to fear. “We wanted to make it approachable, so that you can make some indulgence a part of your lifestyle,” said Gladys. They’ve clearly succeeded, as evidenced by the fact that the elk and venison are the most popular dishes. “And the antelope burger,” Josh chimed in. So, if you’re looking for a new and adventurous dining experience, or suffer from severe allergies, make a reservation at The Archer today! One thing worth noting: you might have to wait a little longer for your food since the Archers take extra precautions to ensure there is no cross contamination. “With the increase in the number of people who need or prefer this diet, I think a lot of diners need to understand that it changes the dynamics in the restaurant… There are certain steps that are taken in the kitchen,” explained Gladys. It’s completely worth the wait.